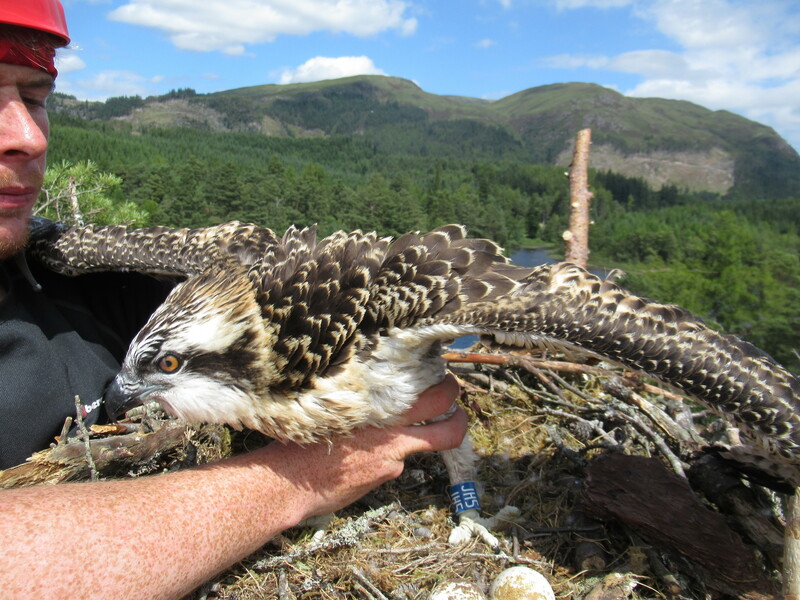 After a difficult year for an osprey nest at Loch Arkaig in Lochaber, conservationists are celebrating the news that a chick has been successfully reared at a neighbouring nest. The feisty youngster – nicknamed “Bolt” – is in a nest 2km from the tree that operates the live camera feed. Earlier in the year a pine marten took all the eggs from the nest, then a technical fault cut the internet camera feed in June. George Anderson of Woodland Trust Scotland said: “Despite the loss of their eggs, our pair Louis and Aila were continuing to bond with each other and the nest so the online audience was still enjoying the show. “It was a great pity when the camera went dark in early June. We checked out every single possible fix on site but nothing worked, so we took the camera out of the tree and sent it away to be assessed. It turns out the problem is likely the result of a lightning strike. “This diagnosis arrived at the same time as pictures of the osprey chick from the next nest so we nicknamed it “Bolt”. It must have weathered the same storm conditions but come out in better shape than our camera did”. The camera’s technical problems have revealed a possible solution to the mystery of the earlier pine marten raid. The tree had been marten-proofed before the breeding season. The lower trunk of the pine tree had a slick coating to stop martens gaining any purchase, and low hanging branches were trimmed to stop the animals jumping on. However, when the tree was visited to investigate the camera fault, it emerged that some branches had partially broken off the tree and were dangling down to the ground. Mr Anderson added: “This seems more than likely the route the pine marten took. As we want to see chicks being reared on camera we’ll be looking to see what can be done to marten-proof the tree next year, but as this kind of egg theft is entirely natural, we don’t want to interfere too much. “Martens and ospreys were both almost wiped out by people in the past but are well able to cope with each other”.